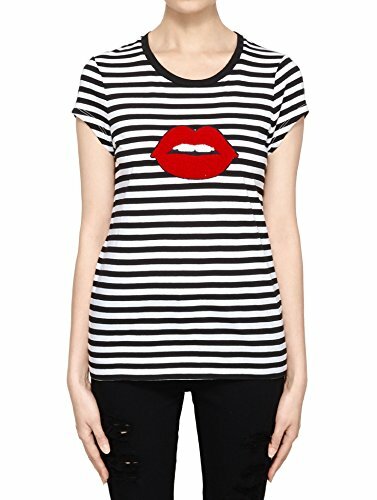 IPHORIA WATERCOLOUR LIPS T-Shirt has a black and white striped body and a crew neck. A red lip embroidered patch comes on the front of this fabulous top. IPHORIA WATERCOLOUR LIPS T-Shirt . Elegant Lips T-Shirt with a Rock & Roll Rolling Stones Vibe Rock this look with leather pants,and any color denim jean or shorts. The Lip T looks great with a leather jacket and goes well with all footwear from flip-flops to your fancy boots and heels. This top is great for women and girls off all ages and fits true to size. If you have any questions about this product by IPHORIA, contact us by completing and submitting the form below. If you are looking for a specif part number, please include it with your message.